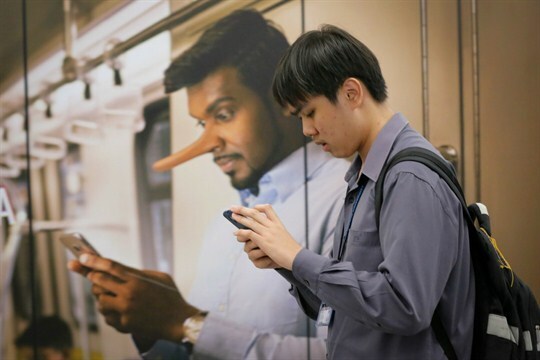 A commuter walks past an advertisement discouraging the dissemination of fake news, at a train station in Kuala Lumpur, Malaysia, April 2, 2018 (AP photo by Vincent Thian). Political observers throughout the Asia-Pacific will have their hands full for the next few months, as several of the region’s largest democracies are set to hold national elections between now and the end of May. But as officials from Mumbai to Manila prepare to tabulate the more than 750 million votes that are expected to be cast across the region, journalists, academics and civil society watchdogs are grappling with a different challenge: politically motivated disinformation, fake news articles, hoaxes and hate speech, spread online via social media and messaging apps.